MyCarHeaven is dedicated to showcasing, talking about and reviewing the most beautiful, cool, iconic and desirable cars, classic cars, supercars and hypercars. If you are reading this, then no doubt youâ€™ll should either own or desire a beautiful cool, iconic or desirable car, due to it's beautiful looks, superb engineering, prestige of ownership or another personal reason. MyCarHeaven is where you can find information about the cars and associated cool stuff that really matters. 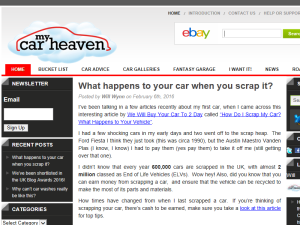 This what your My Car Heaven Blog Ad will look like to visitors! Of course you will want to use keywords and ad targeting to get the most out of your ad campaign! So purchase an ad space today before there all gone! Here’s a cool video from Jay Leno’s garage. Here he talks about a 1971 De Tomaso Pantera. Pantera expert Michael Drew visits the garage to go through what may be the most unappreciated and misunderstood supercar of the 1970s. Built to click with fans the world over, this surprise new Senna is the most realistic and ambitious McLaren ever made by LEGO. Pieced together from one metric tonne’s worth of LEGO elements, you may not be able to drive off in it, but enthusiasts young and old can climb aboard, sit behind the wheel, push the start button in the roof and even hear a simulation of the 208mph car roaring into life. As well as this they can operate the working lights and infotainment system on the model. Fans of the famous brick, as well as fans of the McLaren Senna, will be able to see it soon at one of a programme of events across the world. Prepare for a glimpse of an exquisite yet truly sustainable future: the new Bentley EXP 12 Speed 6e concept car. Characterised by an electric powertrain and groundbreaking design. Consider it the future of luxury. Consider it the future of performance. It looks great, and I love all that tech, however, will it ever be made? Let’s hope so. If you are the owner of My Car Heaven, or someone who enjoys this blog why not upgrade it to a Featured Listing or Permanent Listing?